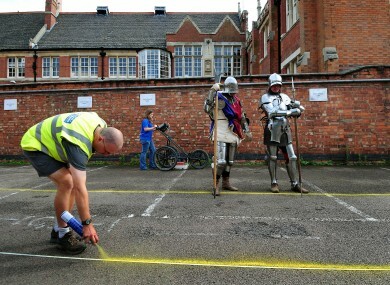 Richard III watches while archaeologists prepare to dig for him. Kidding. It's just actors dressed up. BRITISH ARCHAEOLOGISTS HAVE said that a skeleton found under a city centre car park in central England could be that of the medieval king Richard III. Researchers from the University of Leicester said they had found a male skeleton with similarities to historical descriptions of Richard, who ruled England between 1483 and his death in battle in 1485. The remains, which are well preserved, are undergoing DNA analysis. “What we have uncovered is truly remarkable,” said Richard Taylor, the university’s director of corporate affairs. “This skeleton certainly has characteristics that warrant extensive further detailed examination,” he told a press conference. The team, which has been excavating a car park in the city of Leicester for three weeks, said the skeleton had an arrow-head embedded in its back and had received blows to the skull consistent with injuries received in battle. Today, Richard III is best known as the hunchbacked villain of a play by William Shakespeare – and while the skeleton is not that of a hunchback, it does have a curved spine. “This would have made his right shoulder appear visibly higher than the left shoulder,” said Taylor. The bones were found in what was once the choir area of a church believed to be the king’s resting place, which the archaeologists have uncovered beneath the car park. Richard is thought to have been buried at the Franciscan friary of Grey Friars in Leicester after his death in the Battle of Bosworth in 1485, but the church was demolished in the 1530s and its location had been lost until now. The team used ground-penetrating radar equipment to pinpoint the best areas of the car park to begin the search. Taylor said the team will use DNA from a man who is a direct descendant of Richard’s eldest sister, Anne of York, to try to get a match. The process is expected to take up to 12 weeks. “We have sent the remains off to the laboratory for analysis. DNA testing will take between eight and 12 weeks and the remains are being analysed as we speak,” said Taylor. “It is an exciting discovery”. Email “Bones found at English car park may belong to medieval king”. Feedback on “Bones found at English car park may belong to medieval king”.